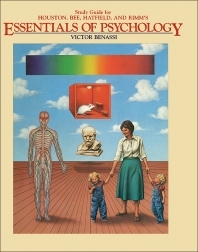 Study Guide for Houston, Bee, Hatfield, and Rimm's Essentials of Psychology aims to aid students in their study of psychology. Each chapter in the Study Guide corresponds to the chapter of the same number in Essentials of Psychology and is broken down into component sections: Learning Objectives, Key Terms, Study Questions, and Practice Quizzes. The topics covered in these chapters include the following: the definition of psychology; the psychological basis of behavior; sensation and perception; learning, memory, and cognition; motivation and emotion; abnormal psychology; and social behavior. Proper use of the Study Guide will help students get the most from what could be their only formal course in psychology. To maximize their learning, all of the components of each chapter must be completed. While no single approach to learning is the best, many students benefit greatly from the use of a study guide.